Every month, marketers generate over 30,000 landing pages here on the LeadPages platform. Many of these landing pages come across our desks here at LeadPages. 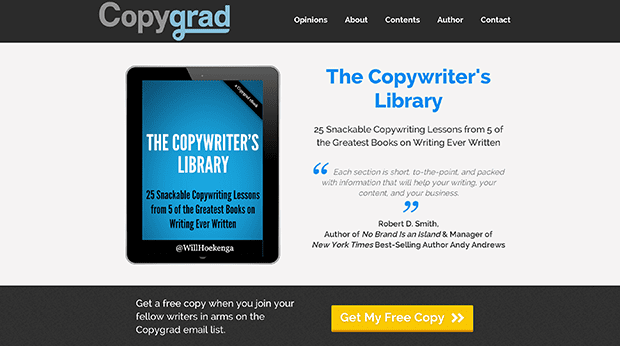 Check out the copy on this Ebook Landing Page from Pat Flynn from LeadPages customer, Will Hoekenga of Copygrad. Not surprisingly, a seasoned copywriter — Will Hoekenga of Copygrad — created some of the best copy we have seen over the past month. 25 Snackable Copywriting Lessons from 5 of the Greatest Books on Writing: First, I have to give copy points for using the word “snackable” to describe “easy-to-digest” copywriting lessons. Second, any copywriter will tell you that adding a number to your headline can up your conversions. For this ebook title, this “copygrad” used not one — but two numbers — to describe exactly what you’ll get in this ebook. Join Our Fellow Copywriters in Arms on the CopyGrad Email List: See what he did here? You’re not just joining an email list. You’re becoming part of a community with other like-minded copywriters. This is a great example of addressing your target audience head on in your copy so you attract the right people to your list. Get My Free Copy: Writing your button copy in the first person like this is an easy, proven way to increase your conversions. If you haven’t tried it yet, I recommend split testing the words “my” instead of “your” in your button copy. If you’re giving away any sort of ebook, video or other lead magnet, I’d recommend you take a closer look at the copy on this page right here. Check out this Macrumors.com LeadBox from LeadPages user, Arnold Kim. If you’re a Steve Jobs or Apple fan, you’ve probably heard of Macrumors.com. What you may not realize is this major site uses a small but innovative LeadBox to grow their email list. It’s Subtle But Effective: This LeadBox appears when you click on the small email icon at the top of each page. This minor call to action is in the ideal place — right next to the other share buttons where you’re most likely to look. It Displays on Every Page of Macrumors’ Site: If you click through to other landing pages on Macrumors.com, you’ll notice that this LeadBox displays in the header for every page. This gives Macrumors additional opportunities to grow their list on each page of their site. It’s Easy to Replicate on Your Site: You can also link any small email icons like this to LeadBoxes on your own site. You may even want to add a LeadBox like this to your site’s header, so you have the option to grow your list on every page of your site as Macrumors does. For a closer look, check out this LeadBox live at www.macrumors.com. Be sure to click on the small email icon so you can see this LeadBox in action. LeadPages customer, David Garland of Rise to the Top created this hilarious webinar page from the new 2-in-1 Opt-in and Webinar Registration Page inside LeadPages. 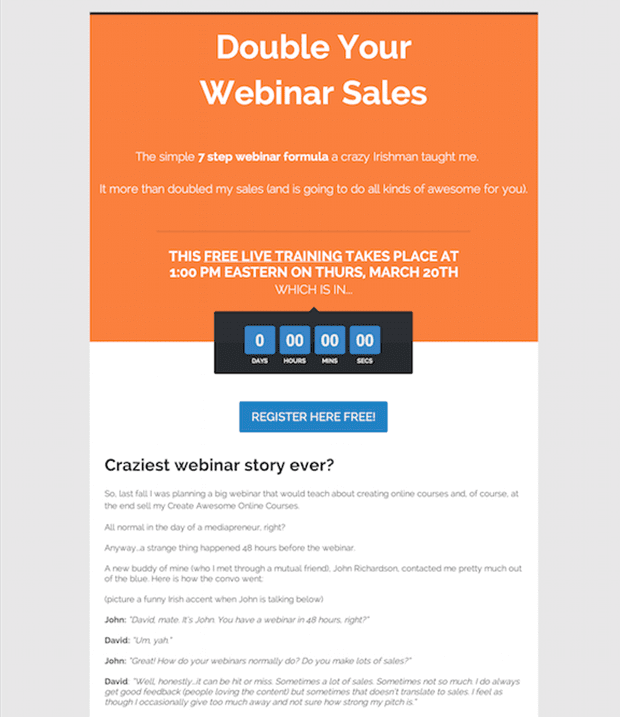 You don’t often see marketers tell stories in webinar copy, like on this 2-in-1 Opt-in and Webinar Registration Page from David Garland of Rise to the Top. But that’s part of the brilliance of this technique. The Craziest Webinar Story Ever: This 2-in-1 opt-in and webinar registration page features the exact same colors and design as the standard LeadPages template. However, adding “the craziest story ever” — compete with an Irish accent — makes this copy so compelling that you can’t help but read to the end. The Script Creates Drama: David Garland could have simply told this story in his copy without the fancy script. However, writing it out as a script makes you feel like you’re part of the story. It creates drama and draws you in even further. That’s a great technique you may want to borrow for your own copy. The Story Sells the Promise: The headline on this webinar page gives you a clear, powerful promise. You know that by attending this webinar you will learn the “7-step Webinar Formula that a Crazy Irishman Taught Me.” Then the story subtly convinces you that this webinar can deliver on that promise. Pretty effective, huh? Honestly, you need to read this page to the end to get the full effect. Go check out this page right now to see the entire story here. The marketers at EasyWebinar used the Video Background Page from inside LeadPages to kick off this launch on the “3 B’s of Building Your Online Community” with Casey Zehman. If you’re planning on hosting a launch any time soon, I recommend taking a closer look at this “3 B’s for Building Your Online Community” launch from EasyWebinar and Casey Zehman. Video Page Kicks Off the Launch: Using the Video Background Page for the first initial opt-in of this launch instantly creates excitement. It also gives you a quick glimpse at what kind of videos and value you can expect to find in this launch. Step-By-Step Videos Walk You Through the Launch: All four videos in this launch give you the “first step,” “second step,” and “third step” to building your online community. In other words, the videos easily guide you through the one, overall, compelling promise of this launch — and deliver on that promise. A Free Download Offers More Value: Once you initially opt-in for this launch, you’re offered an additional download to give you even more value. Once you login for this launch, you’re immediately taken to this Launch Funnel Page from inside LeadPages. Again, this is a great launch structure to follow if you’re planning on releasing a product soon. You can take a closer look at the landing pages for this launch by opting in for this launch here. Check out this LeadBox from LeadPages user, Brian Short on the discussion topics page of AllNurses.com. When you have a site as popular as AllNurses.com, you need a way to entice casual browsers to sign up for your list. Right now, AllNurses.com is using a LeadBox to make that happen. This LeadBox Works for Any Topic: AllNurses.com features discussion topics from many different contributors and sources on a daily basis. Notice: This particular LeadBox (and button) features flexible copy that can be used for any nursing topic on any given day. That allows AllNurses.com to use this LeadBox in multiple places. That’s something to keep in mind for your own blog — especially if you would like to set up a static LeadBox to build your list in each blog post. You can see what I mean when you check out this LeadBox right here. LeadPages customer, Chuck Mullaney of SendReach created this page from the “Sold Out” page inside LeadPages. 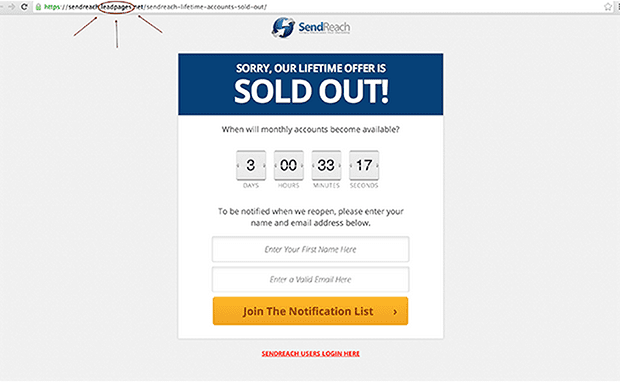 This is a brilliant use of the LeadPages “Sold Out” page from LeadPages customer, Chuck Mullaney of SendReach. It’s Easy to Forget the Sold Out Page: When you’re gearing up for a product launch (or just finished one), it’s easy to forget replacing your sales page with a sold out page like this one. However, creating a simple sold out page is one of the easiest ways to build excitement for your next launch. Great Use of the Countdown Clock: When we first caught up with this page earlier this month, SendReach was just a few days away from releasing their next lifetime offer. The built-in countdown clock not only makes it obvious that this offer is coming soon — it’s also been proven to boost conversion rates across the board. Notify Me About the Next Lifetime Offer: As you can see, SendReach is creating a list of people who are interested in their lifetime offer. Even when you don’t have a launch coming soon, it’s a good idea to create a sold out page like this one so you can continue building your list of interested buyers. LeadPages customer, Mary Beth Storjohann from Workable Wealth created this page from the just-released Social Proof Giveaway Page inside LeadPages. This page gets points for originality. 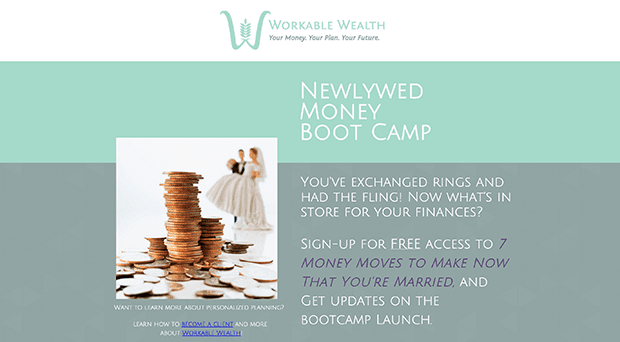 Mary Beth Storjohann from Workable Wealth transformed the Social Proof Giveaway Page inside LeadPages into a notification page for her upcoming Newlywed Money Boot Camp. 7 Money Moves to Make Now that You’re Married: Great title right? This page offers a killer lead magnet to anyone who signs up to be the first to hear about Workable Wealth’s upcoming boot camp. Beyond the lead magnet, this particular page features fantastic bullets and further benefits below the fold. See what I mean when you check out the page live right here. LeadPages Customer, Jeffrey Delrossi created this BoxWild.com page from the Launching Soon Page inside LeadPages. Boxwild.com hasn’t officially launched yet. But in the meantime, BoxWild.com has been split testing two launching soon pages, including this stunning page above. 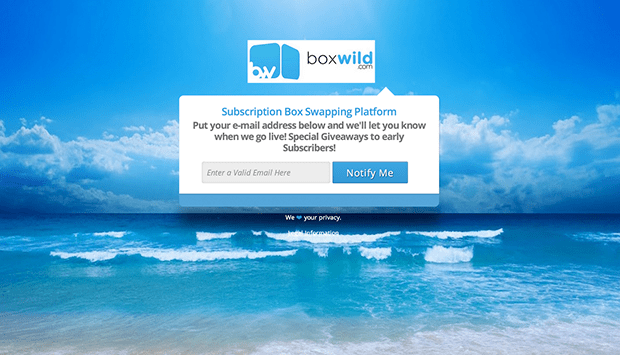 Special Giveaways for Early Subscribers: With a single line of copy, BoxWild.com is giving potential subscribers extra incentive to be the first to join their list. This is an easy technique that you can copy in your own business when you’re getting ready to launch a new site, business or product. Notify Me: Notice that BoxWild.com is using the first person “me” in their button copy. As I mentioned, this has been proven to improve conversion rates. LeadPages customers, Sarah and Steve Blight generated this opt-in page for YourBabyBooty.com from the Basic Squeeze Page Aligned to the Right inside LeadPages. Beyond the gorgeous background image, I recommend you take a closer look at the copy on this page from Sarah and Steve Blight of YourBabyBooty.com. How to Build Intrigue in Six Words or Less: These marketers created intrigue with a single phrase: “what many doctors never tell you.” You can do the same on your own landing pages by revealing what experts or other authorities in your field won’t tell your audience. Another Effective “Top 5” List: There’s a reason why so many marketers give away lead magnets with a “top 5” list. It’s not only effective — it’s almost fairly easy to create. If your current lead magnet is underperforming, you might try repackaging your lead magnet as a “top 5” list like this. Once Again, it’s Free on the Button Copy: Notice how these marketers are saying “Grab the list (it’s FREE)” on the button copy? That’s a great reminder to readers who may be on the fence about opting in. Not bad copy for just a simple box right? 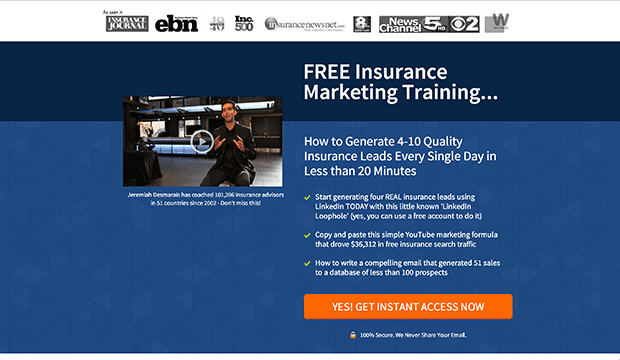 LeadPages customer, Jeremiah Desmarais generated this “Free Insurance Marketing Training” from the new Social Proof Giveaway Page inside LeadPages. Proof. Proof and more proof. That’s how I would describe this incredible opt-in page from Jeremiah Desmarais of the Agency Growth Academy. Same Design, Killer How-To Copy: This page features the same out-of-the-box design that comes with this Social Proof Giveaway Page template inside LeadPages. But the copy sets this page apart. Notice the specific headline that promises: “How to Generate 4-10 Quality Insurance Leads Every Single Day in Less than 20 Minutes.” It tells his target audience in seconds exactly what they can expect to receive in his free training. Testimonials, Media Appearances, and More: This particular template was designed to show your social proof, and Jeremiah is certainly using this template to its full advantage here. Notice how he has eight different logos at the top to show his media appearances and another two testimonials below the fold? Very powerful. Extra Social Proof Below His Picture: If that wasn’t enough, Jeremiah added another piece of social proof underneath his video image. This small copy reads: “Jeremiah Desmarais has coached 101,396 insurance advisors in 51 countries since 2002 — Don’t miss this!” If I was an insurance adjuster, I’d want to hear from someone who had coached over 100,000 of my peers. That’s another form of social proof that makes this entire page even more compelling. Again, I’d recommend you take a closer look at this copy — and possible take notes for your own landing pages. Check it out here. What’s Your Favorite Landing Page or LeadBox? 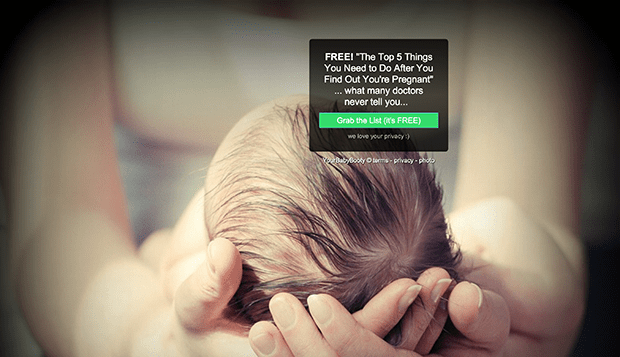 That’s it for this month’s landing page roundup. Before you go, I’d love to get your opinion on this. What’s your favorite page or LeadBox of our 10 favorites above? Give me the number of your favorite page or LeadBox in the comments below. If you have more than a second to spare, take a moment and tell me why that particular number is your favorite.